We offer a selection of funnels that you can add to make your new gift really special. We offer hip flask funnels that are boxed in a presentation box as well as a cheaper no fancy box version. Here at The Pocket Hip Flask Company UK we understand how important getting your favourite tipple into your new hip flask is without spilling it everywhere. To help make life a little easier we sell some great hip flask funnels that will help make this job a little less messy. There really is nothing worse than trying to poor your expensive liquid into the tiny top of these hip flasks and spilling half the contents of the bottle down the side of the hip flask. Adding one of our funnel options to your order will end up saving you precious liquid as well as time. We have a very inexpensive brushed stainless steel hip flask funnel that promises no frills but will out last the cheap plastic funnels on the market. 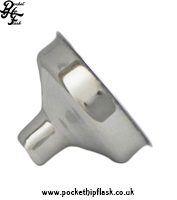 We offer a shiny stainless steel funnel that is nicer than our cheaper brushed hip flask funnel. For customers wishing to make the hip flask funnel stand out as part of the gift we offer a gift boxed stainless steel funnel. 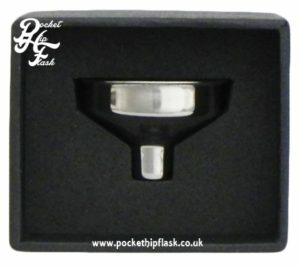 So whether you just want a cheap hip flask funnel that will do the job but at low cost or if you are looking to make a statement with our gift boxed hip flask funnel or pewter funnel we are sure you will find what you are looking for at the The Pocket Hip Flask Company.